You may order any of these graphics, UNITED WE STAND, REMEMBER 9/11, AMERICA, LAND OF THE FREE, USA Love It or Leave It, WayneStock, GraphicsbyLwB, by clicking on any of the graphic thumbnails below. WayneStock 2008 t-shirts and accessories are still available by clicking here on this link. 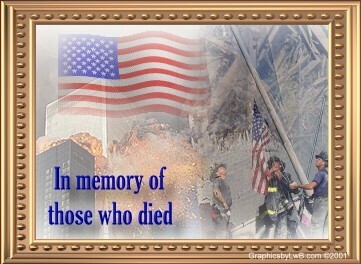 Please take a moment and visit my "Tribute to 9/11 Victims". Click the above banner. And heres another Tribute by Taliesin! Go here!